A 22 kilometres walk to Leighton lock and back today. I need to this more frequently and my feet are getting soft. CRT were still back pumping at Fenny Stratford Lock. 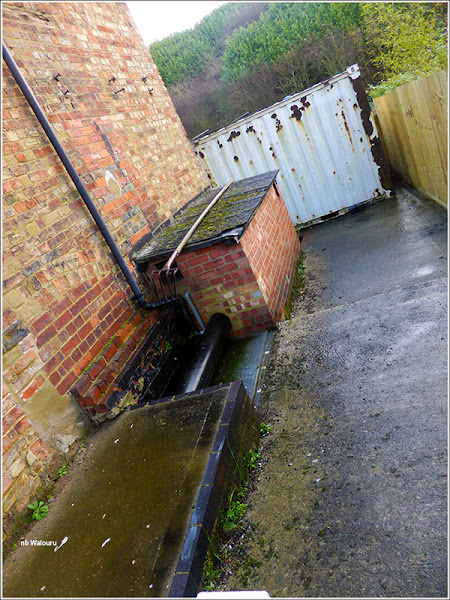 The pump is in the following structure beside the old pump house. You can see the inlet pipe from the canal below the lock. The next photo shows the outlet. 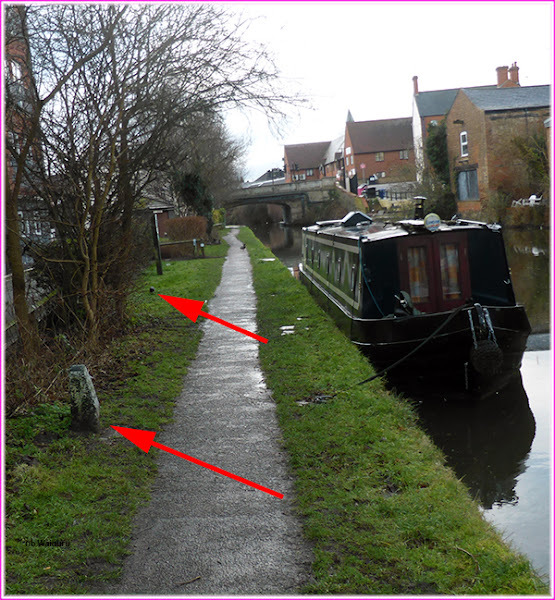 Les (nb Valerie) had left a comment about the canal markers mentioning he hadn’t seen the stone marker. Today I took a photo of the area. It’s on the towpath side at the long term mooring in Fenny Stratford between the Railway Bridge and Watling Street Bridge. The stone marker in the foreground and the canal boundary marker behind. So the problem wasn’t with the sump pound but somewhere between Fenny Stratford and Stoke Hammond. Perhaps this is why the back pumping appears to occur on a daily basis. I’ve previously mentioned the signs at Willowbridge Marina and today I took photos. All boaters require insurance as a prerequisite for obtaining an annual CRT license. This sign seems to imply the boater is responsible for loss/damage if an “incident” occurred during a lift. 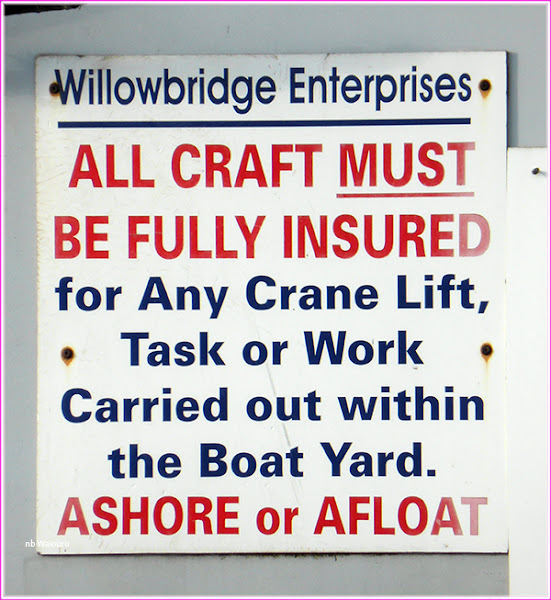 I’d be more interested in knowing If the boatyard had the necessary insurance. 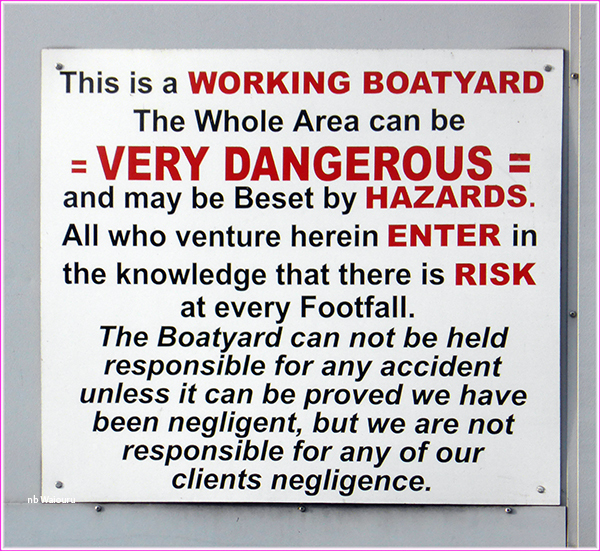 Actually, with a sign like this I would be demanding to see a copy of the boatyards insurance before I allowed them to touch our boat. In my opinion this next sign is partially correct. A place of business does have a legal responsibility to warn visitors of potential hazards. However the business cannot absolve itself from any responsibility by erecting a sign. They must be able to demonstrate they have identified the specific hazards and taken all measures ISFARP (in so far as reasonably practical) to protect all personnel from that hazard. A sign isn’t sufficient and is actually counter productive because it implies the business has identified risks/hazards and has not taken measures to prevent incidents occurring. Soulbury Locks were locked. We had already received an email from CRT notifying us they had been locked in an effort to maintain the water level above the locks. Both the top and bottom lock were padlocked. Note the former pump house on the right. 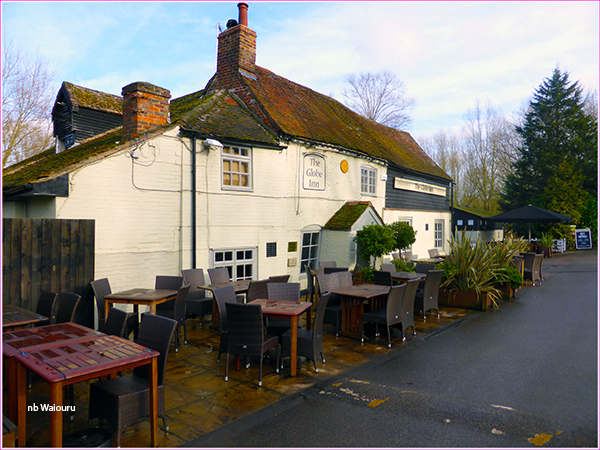 The pub/restaurant beside the lower two locks looked well patronised. There was also evidence the locks might have previously had side ponds. About half a mile from Leighton Lock is The Globe Inn. The moorings look good and the pub looks interesting. We might try and stop here for a meal. 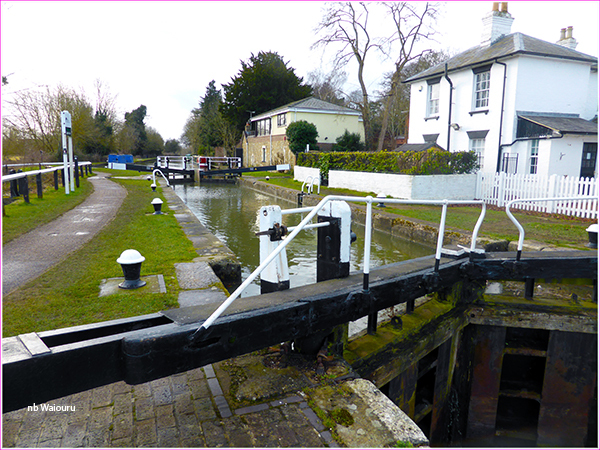 On reaching Leighton Lock I discovered the stoppage was over and the lock open. That’s 3 days early! 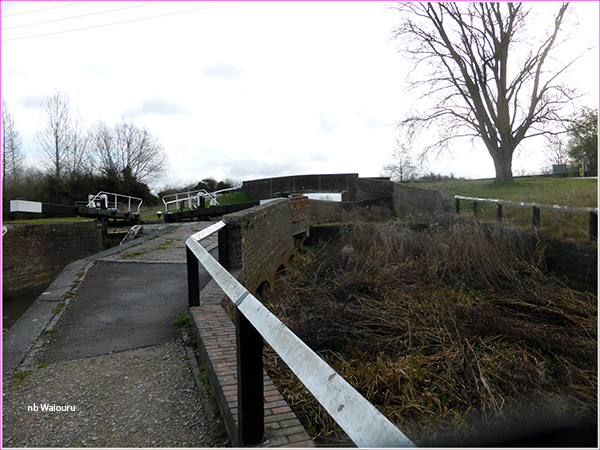 The water level in the pound was normal, so why are Soulbury Locks still closed? Could this be a left hand - right hand issue? I've deleted it, but I think there was an email today saying the stoppage at the Three Locks was over, as water levels had recovered. Our favourite moorings in this area are above Stoke Hammond Lock, just before the bridge leading to the village. 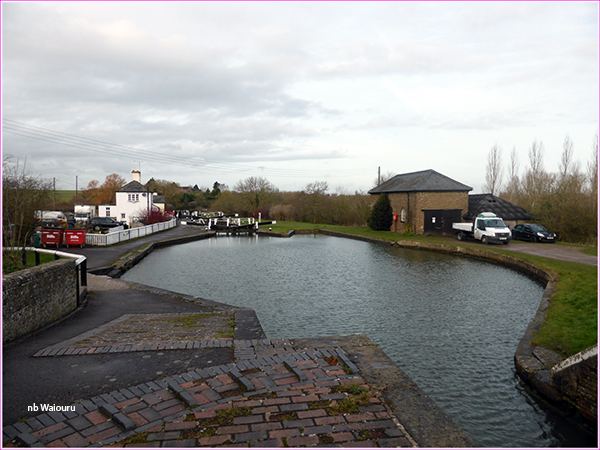 Then above the Three Locks, just past Bridge 109. The Globe moorings are good, although we try to go to the far end, because it's further away from the sewage works on the other side of the canal. After that, Slapton Wharf is good, and below Seabrook Locks. At Marsworth, we prefer the first set of moorings you come to as there are rings there -- whereas nearer the junction you have to use pins. 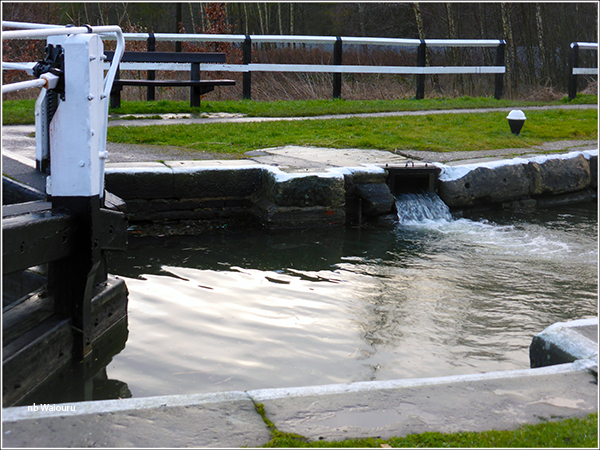 All of the locks, so far as I can remember, from the Tring Summit right down to Stoke Hammond, did have side ponds. Almost all of them can still be seen, at least in part.